There is a lot of talk about the Jonah “in-fill.” I quickly found it on Google Earth — photos of the gas field before the in-fill. This gives some idea of the degree to which this wipes out wildlife habitat. 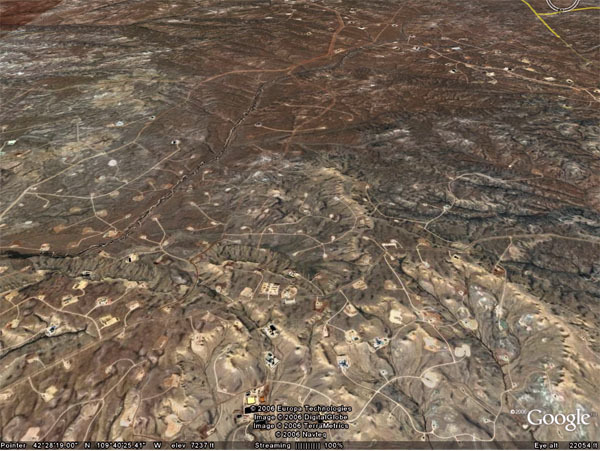 Search around on Google Earth and you will quickly see this is just a small portion of Jonah, and a little movement to the SW brings you to the older mess at the Riley Ridge gas field. Looks like the Allegheny NF here in PA minus the black cherry trees. A virtual pin-cushion of extractive industry. This aerial picture should be the touchstone of a telivision program–like National Geographic–of the final days of the Big Sky Western Landscapes. The degradation is even worse than I thought possible. The picture gives an idea of the damage already done, but much more drilling is planned for the near future. SkyTruth has put together a mini-documentary on the area that explores the issues and impacts, as well as a tool that allows you to explore and learn about the area using Google Earth. Check it out at http://www.skytruth.org!